The serendipitous airing on PBS’s “Masterpiece” series of the BBC TV adaptation of Hilary Mantel’s award-winning books (“Wolf Hall” and “Bring Up the Bodies”) just as the RSC’s heralded two-part production has arrived on Broadway may have prospective theatergoers wondering if they need shell out big bucks for something they get on the tube for free? The answer isn’t as straight-forward as it might seem. Both versions are eminently worthy, but despite their common source, far from identical. This is, of course, the oft-told tale of Henry VIII and his ill-fated marriage to Anne Boleyn who never bore Henry the male heir he so desired, never realizing that the child he did sire with Boleyn would become one of Britain’s greatest monarch’s, Elizabeth I. What makes Mantel’s telling unique is her focus on the king’s chief minister, Thomas Cromwell, with the story told through his perspective. In this revisionist version, Cromwell, often portrayed as a cold-hearted schemer, emerges as the hero, his most questionable actions prompted by loyalty and necessity. And many of his adversaries, even Sir Thomas More, emerge here as considerably less than virtuous. (This is a far cry from Robert Bolt’s “A Man for All Seasons.”) Boleyn herself is bossy and shrewish. Henry VIII is mercurial, but rather more likable than normally portrayed. The narrative charts how Cromwell helped his monarch rid himself of both first wife Catherine of Aragon and Boleyn, and helped dismantle the Catholic monasteries, many rife with corruption. TV adapter Peter Straughan and RSC writer Mike Poulton have chosen different paths. Thus, a family tragedy for Cromwell, quite significant in the TV version, is an off-stage occurrence here. The demise of Anne Boleyn is perforce handled very differently given the limitations of the stage. But there are many other points of difference, large and small. And not all characters appear in both versions. The TV series is notable for many indoor scenes lit by candlelight, but the stage production seems to aim for a similar ambience. Christopher Oram’s costumes are sumptuous though the stage design is rather plain and, for the most part, darkly lit (by Paule Constable for Part 1, and David Plater for Part 2.) This suits the grave events portrayed, but sometimes makes identifying all the characters a little tricky. The series, with its reliance on close-ups, and generally more focused approach, is easier to follow. But make no mistake: Poulton has done a masterful job, and his choices are perfectly valid. Straughan builds Cromwell’s motivations around a cruel pantomime performed by members of the court after the death of his former employer, Cardinal Wolsey, and the recollection of that mockery braces Cromwell for the dirty deeds he must perform for king and country. Poulton has instead created periodic exchanges between Cromwell and Wolsey’s ghost which reinforce Cromwell’s continuing affection for his late mentor. The cast is top-drawer. Mark Rylance is on screen almost every moment of the TV series, and his face speaks volumes. Without the benefit of close-ups, the also excellent Ben Miles – last seen here in very funny revival of “The Norman Conquests” – must project his motivations through more outgoing means. TV’s Damian Lewis is a slimmer king than Nathaniel Parker presents here, but unless I’m mistaken, I think Henry has more dialogue in this version. Lydia Leonard’s Anne Boleyn is, like TV’s Claire Foy, a formidable lady, one not to be crossed, but also like Foy, most piteous in the end. Paul Jesson’s Cardinal Wolsey portrays a different sort of affable vulgarity than Jonathan Pryce in the mini-series. And so it goes. Each act breaks at an appropriate cliff-hanger in the narrative, and as crisply directed by Jeremy Herrin, the plays rarely drag. 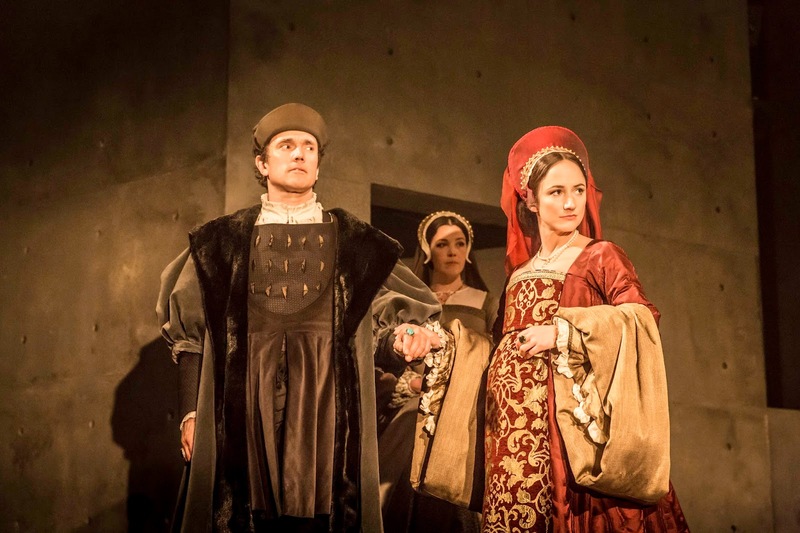 Perhaps not quite in the same glorious league as the RSC’s legendary two-part “The Life and Adventures of Nicolas Nickleby” (imported to Broadway twice), “Wolf Hall” is still an ever-fascinating yarn, told with superb stagecraft, and topflight British acting. Harry, thanks for overviewing the difference between the two productions. Having just finished both books before Wolf Hall started on PBS, I found that even I was confused by the first telly episode because of the wonderful atmospheric lighting -- they all looked alike! I thought the play might be easier so interesting to learn that it wasn't it that regard. Still, to see it live -- let's just say I'm wishing I could spend springtime in New York this season. I don't think I would want to be a Tony judge this year!